Postcard FR-374233 from France is a bookmark postcard entitled "At the Same Time on Earth ..." It measures 20 cm x 6 cm or 7.87 inch x 2.36 inch and has a stamp with postage for a 20-gram (0.7 oz) letter. I became curious on how to mail a bookmark postcard from the United States. By the USPS regulations, a postcard needs to be at least 3.5" high x 5" long x 0.007" but no more than 4.25" high x 6" long x 0.016" thick in order to qualify for the first class postcard rate (US$ 0.34 domestic and US$ 1.15 international in 2014). 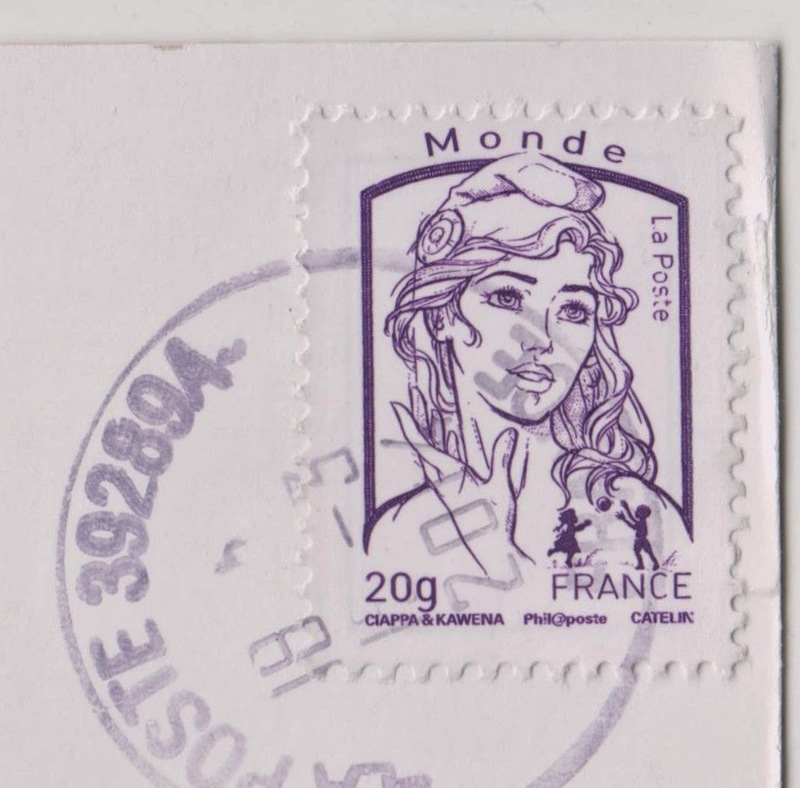 Therefore, because it does not meet the dimensions above, the USPS will consider it a letter and letter-size postage will be charged (US$ 0.49 domestic and US$ 1.15 international) for a mailpiece with a size up to 6.125" x 11.5" x 0.25". In addition, it has an aspect ratio (length divided by height) of 3.33, which falls outside the required aspect ratio range for a first class letter (between 1.3 and 2.5). As a result, it will incur a nonmachinable surcharge of US$ 0.21. The total postage required for such a bookmark postcard from the United States will be US$ 0.70 domestic and US$1.36 international.